As with most issues, William Branham has some strange opinions on the subject of suicide. Throughout the history of Christianity, there has been a rejection of suicide. The Christian prohibition of suicide is clearly based on an assumption that our lives are not ours to do with as we please. Life is a gift from God. But this did not appear to be the view of William Branham. 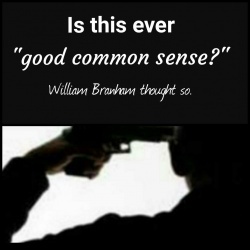 1 William Branham approved of suicide if it was "good common sense"
William Branham approved of suicide if it was "good common sense"
One man had enough—enough good common sense up here. That said he was going to be a preacher, he'd get on Sunday morning and preach, and then he'd go down there on… and get on the radio broadcast and sing rock-and-roll songs and everything like that, so he finally took a pistol and blowed his brains out. I respect the man for doing it. That's right. That's right. He—he had more… He had as much sense as them hogs did, anyhow, when they got the devil in them they run down to the water and choked. Some people don't even have that much. William Branham claimed that the composer of the great hymn "There is a fountain, filled with blood" committed suicide just after he wrote the song. However, his information was incorrect. The hymn was published in 1779 but was written some years prior. At age 69, Cowper became ill with dropsy (edema) in early 1800 and died off heart failure on April 25, 1800. How many read of William Cowper, the great English poet? You know, wrote, "There is a fountain filled with Blood, drawn from Immanuel's veins." After he wrote that song, did you hear what happened to him? I stood by his grave not long ago. He tried to commit suicide, and drowned in the river. In London, England… And I stood there by his grave, and I laid my hand over on the tombstone, and I thought, "God rest your gallant soul." I thought, "Mr. Cowper, why were you considered a neurotic?" You know, after he wrote that song, "There is a fountain filled with blood, Drawn from Emmanuel's vein," he came out of that inspiration and got—went down to the—to a cab—tried to find the river to commit suicide, to drown himself in the river. William Cowper; that's his history right there by his grave. But Cowper was not buried in London. He is actually buried in the chapel of St Thomas of Canterbury, St Nicholas's Church, East Dereham, which is over a 100 miles northeast of London. Why would William Branham make up such a convincing story about something that was completely untrue? William Branham stated, contrary to scripture, that Saul did not kill himself. Why did William Branham contradict scripture? It appears he simply did not read the Bible carefully. Here is yet another clear example of William Branham apparently not understanding the clear meaning of scripture. In fact, Foster became ill with a fever in January 1864. Weakened, he fell in his hotel, cutting his neck. His writing partner, George Cooper, found him lying in a pool of blood. He died in hospital three days later, at age 37. How many every heard of Stephen Foster, give America its best folk songs? He had it in the head but not the heart. Every time inspiration would hit him, he would write the song. Then when the inspiration left him, he didn't know what to do with himself, and he was lost. He—he—he had been on a drunk. And finally when he started to come out of that inspiration, he called a servant, and took a razor and committed suicide. That's right. This page was last edited on 24 July 2016, at 00:26.